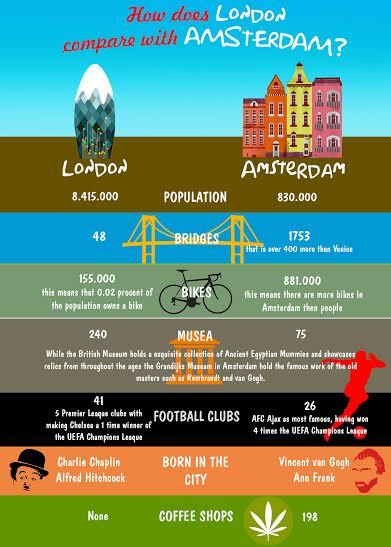 I stumbled upon an interesting infographic online by jaloezieen fabriek that shows a comparison between London and Amsterdam. I am often asked how to decide between these two cities when planning a trip so felt it was a great way to answer that ever present question! Visiting these two cities that are steeped in history and rich culture with stunning architecture is a great way of spending your trip time and a great choice to visit both of them. I visited them both on a trip to Western Europe years ago and honestly couldn't pick between the 2 as they both are so wonderful in their own ways. London can be considered an exciting city ,the capital of England and the United Kingdom. It is placed on the River Thames and was founded by the Romans. There are the famous landmarks to visit the Tower of London, the Palace of Westminster and Westminster Abbey, Greenwich the historic settlement, Buckingham Palace, St Paul's Cathedral, the London Eye and Trafalgar Square and many many more but you get the point....plenty to do! London is the heart of numerous museums,galleries,cultural institutions with a vibrant and diverse social life and it is considered the most progressive city in the world. You'll be blown away of how beautiful the city is. 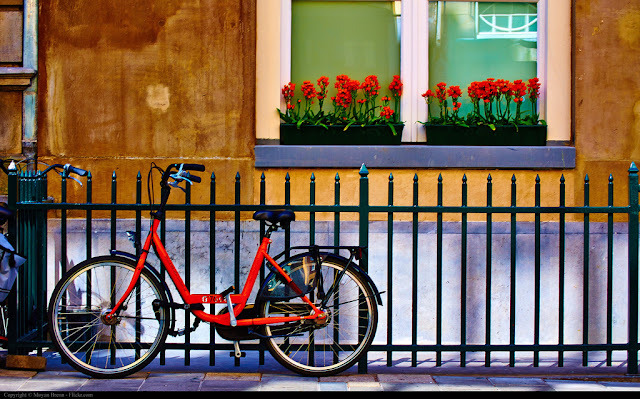 Amsterdam is a popular touristic attraction with rich architectural history , the home of hundreds of kilometres of canals offering a really unique area to bicycle or take a long stroll. It has lots of parks and open spaces the home of fascinating museums located on the Museumplein. Amsterdam offers a bit of everything; culture,history,nightlife, cafes, markets and plenty of beer, the perfect combination for an unforgettable trip. Have you been to both? Only one? Which would you pick to visit again? Tell us about it in the comments below!